BELLY DANCE 6:30 p.m. to 8 p.m.
March 30, April 6 and April 13, with Guest Instructor Donna K. "Katie" Woodruff. This class is for all levels. Learn basic, core moves and developing fitness. Please pay Katie directly, $15 per class. March 30-April 13. $15 per class. $15 per class, 4 classes for $45, or $120 for 12 weeks. ► BELLY DANCE 6:30 p.m. to 8 p.m.
basics & beyond of Cabaret (glitzy) belly dance style. For more details call, Marlene Delachica-Hiebert at 512-657-3241. Check calendar for updates or class cancellations. $45 for four classes or $90 for 8 classes. They used to arrive by horse and camel — now it’s compact cars and SUVs. Belly dancing hasn’t changed much since harem days, but the dancers definitely have. 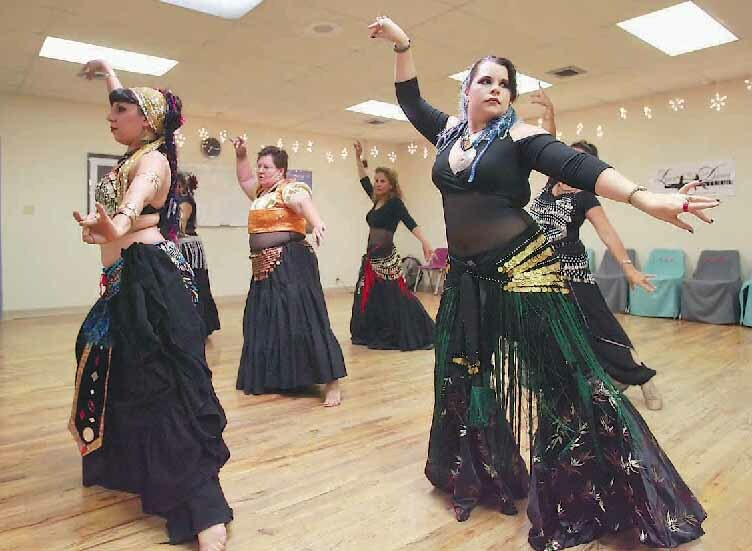 On a recent day at Odessa’s Love to Dance Studio, members of the Storm Troupers belly dance group piled out of their rides one by one with purses and cell phones in tow, each outfit more ornate than the last. 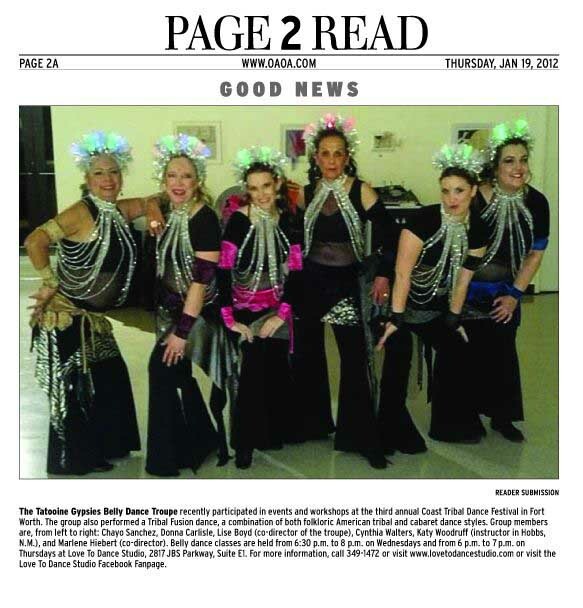 These women make up one of the Permian Basin’s few belly dancing troupes. The idea of bringing an ancient art form to life started as a passing curiosity for most. Now, after tons of practice and performance, group members have camaraderie, more self-confidence and some super-sensual moves. Storm Troupers leader Andrea Mauldin said the group started about four years ago. The dancers hail from Big Spring to Pecos, and they practice twice a week when time permits. Spirit of Women events, senior centers and Firecracker Fandango. Their personalities are as varied as the moves they’ve memorized. There’s Socorro Rivera, the massage therapist/hair stylist/salsa dancer from Pecos. Administrative assistant Whitecotton crossed the Atlantic after marrying a Texan and now calls Big Spring home. She’s from Britain. Odessan Angela Olsen is a teacher. Cynthia Walters is a longtime dancer who moved to Odessa from Houston recently. Debbie Underwood’s making the most of her retirement, and Mauldin, belly dancer extraordinaire, serves up drinks and fine cigars at The Hemingway when she’s not wowing crowds. Mauldin said belly dancing’s origins are difficult to nail down — almost as hard as it was for Whitecotton to find a troupe in West Texas. of old as a way for women to prepare for child birth. Then it turned into a celebration dance once the baby was born and blew up from there. Belly dancing’s ancient moves haven’t morphed from their original form, Mauldin said, but there are lots of modern twists. All of the Storm Troupers said their body image has improved since joining the group. “I feel a lot better about myself. I wouldn’t have worn this two years ago,” Rivera said while raking one of her hands across a tightly fitted black shirt. Walters said belly dancing has been freeing in that way. And there’s Whitecotton’s favorite part. she whispered with a grin. Making new friends helps, too. None of the women knew each other before joining the troupe, and now they’re practicing at each others’ houses while dishing the latest on kids, husbands and future plans. What’s the coolest thing about belly dancing? > The moves. > The clothes. > The music. > The women. One of the most enjoyable parts of belly dancing is dressing up. Here’s a list of what you’ll need to get started. >> Headdress: These can be super simple or customized to the max. >> Arm cuffs, bracelets and rings: Bling, bling! >> Bras and halter tops: Put some bells on these bikini-like tops and have a ball. >> Hip scarf: Perhaps the most recognized part of belly dancing attire. It makes the hip shakes stand out. >> Long skirt: Remember, it’s all about the midsection, so your legs get a reprieve. >> Shoes: Forget ’em and go au naturel. That’ll give you some extra cash for body glitter and finger symbols. Belly dance instructor Andrea Mauldin, left, Victoria Whitecotton, right, and the rest of the class work through a warm up dance Wednesday evening at Love to Dance Studio..
Socorro Rivera, of Pecos, wears a special headdress that she designed herself Wednesday evening during her belly dance class at Love to Dance Studio. The headdress features a headband that Rivera purchased in Pakistan.